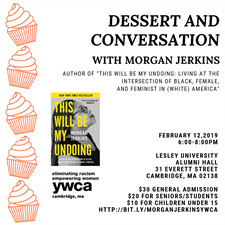 Join YWCA Cambridge for our first annual Dessert & Conversation fundraiser, featuring New York Times Bestselling Author, Morgan Jerkins for an hour long discussion of her book, "This Will Be My Undoing: Living at the Intersection of Black, Female, and Feminist in (White) America" and her work in racial justice. This will be followed by a book signing. The event will include delicious desserts and cocktails.